The Bolshoi theater in central Moscow. On March 28 the Bolshoi Theater turns 240 years old. RBTH asked Bolshoi Museum director Lidia Kharina to reveal the least known facts from the history of Russia's principal theater. It is considered that the history of the Bolshoi began in March 1776 when Prince Pyotr Urusov received permission from Empress Catherine II to open a public theater in Moscow. But several years ago it was discovered that actually the empress had issued what today would be called a tender to establish a public, not court, theater in 1766. Four applications were filed: one from a Frenchman, two from Italians and one from a Russian, Nikolai Titov. Titov won and founded an opera house on the Yauza river, which staged its first performance on Feb. 21, 1766. 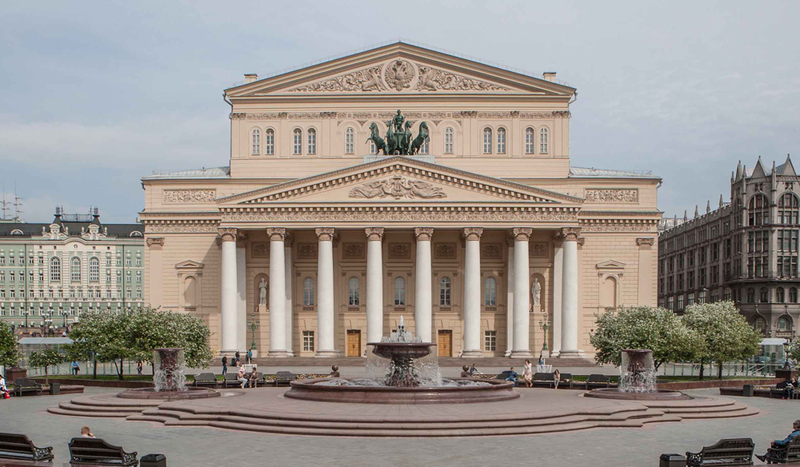 We can say that the history of the Bolshoi began with that opera house. Three years later Titov practically went bankrupt from his debts and was forced to sell the tsarist license for the theater. It was bought by two Italians, Belconti and Cinti, and two years later another Italian, Gratti, became the owner. After five years it was the turn of Pyotr Urusov. The building that Urusov built burnt down before the opening and he decided to sell the enterprise to Englishman Michael Maddox, a mathematician from Oxford who had been invited to Russia to teach Tsarevich Pavel Romanov the sciences. He chose a plot of land where the Bolshoi stands today and built a three-story brick building. On Dec. 30, 1780 the theatre was inaugurated in a solemn ceremony. Maddox's theater had a hall with almost 1,000 seats, a stage and an orchestra pit. Directly over the stage there were boxes where "theater lovers" sat, and almost everyone was from the nobility. They were the ones to give the audience signals. For example, if they showed two fingers, everyone would loudly applaud. These noblemen can be considered the predecessors of the claqueurs, or those hired to clap at certain times during a performance. The most famous balls at the opera now take place in Vienna. But the Viennese Opera House was built almost 100 years after the Bolshoi. At first Maddox had thought of creating rest cabinets at the Bolshoi where during the day women could socialize and men could hold negotiations. In 1788 the theater acquired its Rotunda circular masquerade hall, where balls took place. As amazing as it sounds today, the Bolshoi's first prima ballerina was a Frenchwoman. Félicité-Virginie Hullin Sor arrived in Moscow by invitation with her dancer husband. She dazzled everyone at the premiere on Jan. 6, 1825 after the reconstruction of the burnt Bolshoi Theater. In 1918 Vladimir Lenin insisted on demolishing the Bolshoi Theater. He said that opera was a bourgeois art, it cost too much, and that the performers were arrogant and wanted only money. Surprisingly, it was Joseph Stalin and Anatoly Lunacharsky, who is considered the USSR's first culture minister, who changed Lenin's mind. A plafond with the painting of "Apollo and the muses" was created in the middle of the 19th century. In 1940 the government held a competition to re-color the muses in "Soviet worker style." Many well-known Soviet artists participated in the competition, including Yevgeny Lansere and Konstantin Yuon. At the beginning of WWII the plafond was damaged by a bomb. It was restored and new peasant-muses were added by Pavel Korin. There was censorship both in tsarist and in Soviet times. During the tsarist era the composer could make use only of a special collection of librettos written exclusively by Russian authors. Later, in 1948, there was a case when all the managers – from the general director to the chief conductor – were removed for having staged Vano Muradeli's The Great Friendship, in which Vladimir Lenin first appeared as a character. The Communist Party accused everyone of formalism and distortion of historical facts: The libretto spoke of hostile relations between Russians, Georgians and Ossetians in the 1920s. Working at the Bolshoi was a dream for performers. In the USSR the theater guaranteed the highest level of salary and other privileges. However, there was one scandal involving escape from the Bolshoi: In the summer of 1979, during the tour in New York, dancer Alexander Godunov asked for political asylum. The Soviet authorities tried to send his wife, ballerina Lyudmila Vlasova, home to Moscow, but for three days the Americans would not let the plane take off. In the end Vlasova was convinced to return to Russia and Godunov enjoyed a short career with the American Ballet Theater. The famous Apollo Quadriga, or the chariot of the gods, has adorned the theater since 1825. The first was made of alabaster and broke during a fire. It stood not facing the visitor but sideways. The current bronze quadriga is considered the work of sculptor Pyotr Klodt (author of the sculptures on the Anichkov Bridge in St. Petersburg), though there are no documents confirming this.